Hotel dibangun pada 1. Properti ini terdiri atas satu lantai utama. Properti ini terdiri atas 49 kamar. Properti ini terdiri atas 3 kamar single dan 25 kamar double. Hotel yang menarik ini sempurna untuk liburan akhir pekan atau liburan yang lebih lama. Meja depan menawarkan resepsionis 24 jam. Anda dapat menjaga barang berharga agar tetap aman di brankas Hotel. Hotel ini menyediakan lift. Terdapat teras yang menyenangkan, tempat Anda dapat bersantai dan menikmati sinar matahari yang hangat. Hotel ini menyediakan layanan pengambilan kunci. Terdapat jangkauan ponsel di seluruh ruangan Hotel. Hotel ini menawarkan layanan kamar. Anda dapat memanfaatkan layanan Laundry di Hotel. Staf multibahasa tersedia untuk membantu Anda dengan pertanyaan apa pun atau pemesanan layanan. Binatang peliharaan diizinkan di hotel ini. The rooms are in the cellar, no window. Really bad air, even in the vinter. No ventilation. We could not stay there, had to change to another hotel. I just stayed only for a day and everything was good for me. I am satisfied with quite convenient location, clean room, reasonable price and tasty breakfast. The room is hard to get through. First go through the reception, walked down to the narrow round shape stair ways, go through the hotel restaurant kitchen, narrow lobby and pass through a courtyard and down a few steps to hotel room. Guess that's expected for an old house hotel in old town. The wifi works well and bathroom is huge but odd shape design for a bath tub with no curtain from water flowing out. Bedroom is huge too and quite comfortable. For those with huge luggage like me, you can always get the porter to help you to carry it up the narrow round shape stair ways. Arrange with reception before checking out. Location was good. It's near the touristic places. The staffs were friendly, polite, and willing to help all visitors. Poor service, tiny and poor room with dirty and disgusting carpet. The bed was about to collapse. Worth for 50 euros for two person but no more. We paid 100 euros for standard room and it was definately NOT worth for this amount. I truly regret that we didn't choose another place. we reached the hotel in the mid night & first got scared seen rooms in the basement, very old, very country style, kind of a tunnel to go to the rooms. next day we had a city tour with a guide and realised that we are staying in a piece of art. we loved it. 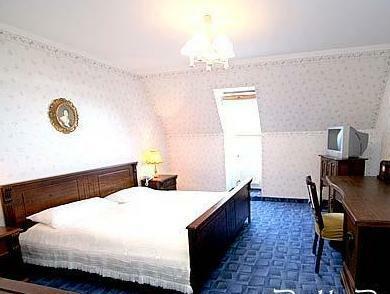 one of the most beutiful area is around this hotel which is in the tallinn old town. breakfast was reasonable for the price. very special restaurants are just next door. the only problem is that you are to use a tiny spiral staircase to go to the basement. i did not know how to take my laguage down there and there were no body to help me in the midnight at check in. check out was smooth as i got help. 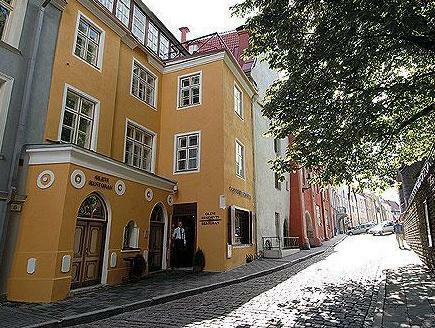 the hotel has a great location, it stays right in the old town. however, i had a very small room in a basement with no view. since you have to pass several floors up and down, the hotel is not good for people with disabilities or travellers with a lot of stuff. there is no long term parking nearby however you can unload your luggage in front of the hotel. the buffet breakfast was good. zhe hotel has a free wifi. Pittoresque old building, but the downside is that there are a lot of stairs to climb! Our room was on the top floor and it was very hard to drag our luggage there. No elevator and not any help from the staff. We were delighted to find the Hotel looked exactly like the promotional pictures. Cobbled streets, olde world entry foyer and beautiful building. Beware of rooms with a view - higher floor rooms better, but the steps! Our attic room on the seventh floor was great, but involved going DOWN about 30 steps and then UP about 80. For an unscheduled 2nd night, room on the fourth floor had fewer up-steps, but no view and some unpleasant odours at times. Restaurant was good; breakfast ample choices. Clean, Good brakefast, Good location. Small room and no AC. The hotel is in a very good location in the old town near everything. It was clean and they made up the room everyday.Brakefast was very good. The romm was a bit small and it had no AC, too hot to sleep in when the day temperature was up to 33 degrees celsius? Bra valuta för pengarna, småbarnsfamilj m tre barn. Frukosten var ok, den ingick trots allt (men takbelysningen gjorde matsalen rätt ocharmig). Svajigt wi-fi, fick springa mellan olika rum då vi blev nedkopplade hela tiden, svårt att planera sin vistelse med dålig tillgång till nät. Mkt centralt beläget, ett stort plus! Trevlig och hjälpsam ägare. Många krångliga trappor till rummet! Vi var 11 personer (varav 4 barn) som bokat 4 stycken 3-bäddsrum. De extra insatta sängarna visade sig vara av mycket låg kvalitet. Min dotter, 41 år ca 50 kg, föll igenom sängen första natten och tillbringade resten av natten på golvet. Hotellet försökte åtgärda sängarna nästa dag, dock utan att lyckas. Det blev golvet alla tre nätterna. Vi försökte förklara orsaken till att sängribborna ej hölls fixerade, men språkproblemen var tydligen för svåra. All personal var rysktalande, men engelskan var ganska bristfällig ( vi talar alla mycket bra engelska). En annan incident: När jag skulle betala fick jag svaret att det redan var betalt och jag fick också ett kvitto. Kvittot innehöll mitt Eurocardnummer men var inte underskrivet. Jag har inte kollat med Eurocard och vet alltså inte om jag har betalat eller inte. Om betalning ej gjorts och skall göras, förväntar jag mig att alla eventuella omkostnader betalas av hotellet. Tillgängligheten till de flesta rummen var besvärlig, särskilt om man hade mycket bagage. Först ner genom en trång spiraltrappa, därefter genom en serveringslokal där personal jobbade, därefter ner genom en lång med små trappsteg här och där, därefter åter genom en passage med några trappsteg ner och upp, därefter till en ganska normal trappuppgång. Vågar inte tänka på vad en brand skulle få för följder, särskilt för äldre! Vi är ändå nöjda med vistelsen på hotellet! Rummen var bra och de riktiga sängarna bra! Die meisten Räume des Hotels befinden sich im Keller. Ein Teil der Räume sind "Innenkabinen", also haben keine Fenster nach aussen. Die Fenster gehen dann auf den Flur. Die Räume im Keller waren extrem heiß, da die technischen Anlagen wohl das gesamte Kellergeschoß aufgeheizt hatten. Das Hotel hatte Lüfter aufgestellt, was die Temperatur aber nicht minderte. Eine Klimaanlage war nicht vorhanden. Nach Beschwerde konnte das Zimmer getauscht werden. Zimmer Katastrope.Uunfreundlicges Personal an der Reception. Das Hotel ist unbrauchbar, schmudlig, nicht sauber. Die Zimmer waren im Untergrund (Keler), keine Fenster, kein Duschvorhang, unheimlich! Reception, unfreundlich, bequem, faul. Das schlechteste Hotel in dem wir je waren.